Everyday life, kids, pets and entertaining take their toll on carpets. In fact, one square metre of carpet can hold up to half a kilogram of dirt. Inclement weather can double that. Regular vacuuming cannot remove all of that dirt. Carpeting is made to trap dust and allergens and to keep them from becoming easily airborne. That being said, regular vaccuming won’t clean carpets. It removes loose, dry dirt form the carpet fibres and backing. Pets and small children require a more thorough program of deep cleaning. 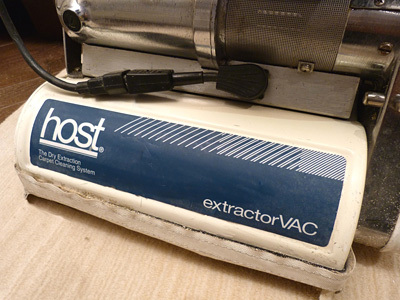 That’s why, Yorkville Carpet Care, uses the HOST dry extraction system. Recommended and approved by carpet manufacturers and fibre producers worldwide, its dual brush process lifts pile and deep cleans carpets, area rugs, even Oriental and Persian Rugs from dirt, soil and stains, leaving your carpets clean fresh and dry. 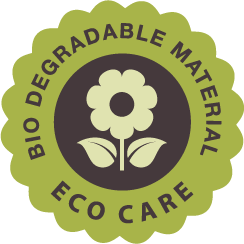 The HOST system is a bio-degradable, environmentally friendly dry cleaning process that is green seal certified, so rest assured that our carpet cleaning techniques are safe for you, your family and your pets. Area rugs should be cleaned AND rotated on a regular basis to inhibit traffic lanes/patterns and to ensure a more even wear pattern. Our low moisture cleaning process allows us to clean rugs right where the lie with no risk of damage to the wooden floors underneath. Furthermore, our area rug cleaning method limits any wear and tear to the rug leaving it looking next to new after cleaning. Everything centers around our revolutionary dry polymer. 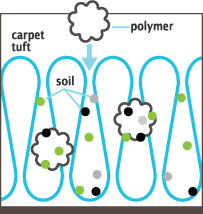 its unique properties allow it to absorb and remove dirt from deep inside your carpet. Once our plymer is brushed into your carpet and finds and collects the dirt, dust, allergens and other particles. 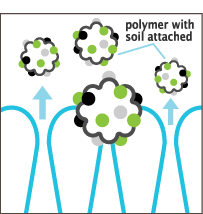 The polymer and attached dirt are removed, leaving your carpet clean and dry.